Daily use means you never have to scrub again! Prevents limescale build-up in your shower. Bathroom cleaner that effectively prevents soap scum and grime. Leaves the shower sparkling clean. 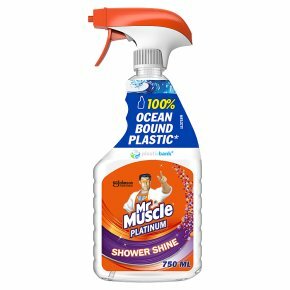 For quick and easy bathroom cleaning.Mr Muscle Platinum Shower Shine is a cleaning partner that takes care of the tough stuff for you. The formula prevents limescale build-up and helps remove soap scum and grime. Start with a clean shower. Immediately after showering, spray a light mist of Shower Shine over the wet surfaces including the curtain and/or door. Do not scrub, rinse or wipe off. Run the shower before entering to rinse the shower and bath floor. Always stand on a non-slip surface when in the shower or bath. Do not use on worn, damaged or cracked surfaces, gold-plated fittings, brass, natural marble, polished, painted or oiled wooden surfaces or resurfaced enamel. If in doubt, refer to manufacturer´s instructions. If medical advice is needed, have product container or label at hand. <br>Keep out of reach of children. IF IN EYES: Rinse cautiously with water for several minutes. Remove contact lenses, if present and easy to do. Continue rinsing. Do not breath spray. Wash hands thoroughly after handling. Use only in well-ventilated areas. As with any household product avoid prolonged skin contact with this product.<br>Contains 1,2-benzisothiazol-3(2H)-one.<br>May produce an allergic reaction.